Building upon the basic courses taken as undergraduates, graduate students will further develop their critical thinking skills and acquire the advanced expertise needed for careers as researchers and technical experts. 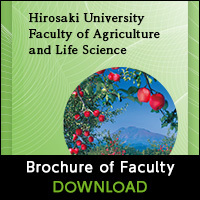 Exceptional students will be encouraged to pursue doctoral degrees at the United Graduate School of Agricultural Sciences at Iwate University. An “academic research program (researcher-oriented)” and an “academic research program (technical expert-oriented)” are offered in each Course to match diverse students needs. In addition, a “practice-oriented research program for part-time students,” with a reduced course load required for graduation, is available for part-time students who are employed but wish to continue or resume their education. Interdisciplinary “cross-courses” and courses designed to fill the gaps between different academic fields, referred to as “sub-courses,” are offered to meet changing societal needs, and enable students to customize their study program to extend beyond the boundaries of their respective graduate coursework. “Specialized courses” and “sub-courses” in each Course are offered evenly in both spring and fall semesters so that students entering the program in the fall will not be disadvantaged. Students will be able to take all available “common courses” the semester they enter the program. Credits are generally granted based on examination results. However, some Courses will grant credit based on performance in class and/or the results of reports or other projects. Grades for each course will strictly adhere to the criteria stipulated below. To obtain a Master’s Degree in this program, students are required to study for at least 2 years and earn at least 32 course credits. They must also, after having received the necessary research supervision, pass the thesis review and a final examination. Part-time students who continue to hold down a job while pursuing a master’s degree may choose, with the approval of their supervisor, to substitute a research report for the master’s thesis. Evaluation of the master’s thesis or research report will be conducted through a strict review of the thesis and a final examination to be conducted by one primary reviewer and two co-reviewers. The master’s thesis must be at a level suitable for publication in scientific journals and as such must impart new knowledge. The research report must reinforce or reaffirm previous knowledge. The universality observed in the basic life activities of all organisms and the biodiversity that is observed in the morphology and behaviors of individuals are formed by the interaction between the genetic information coded in DNA and the surrounding environment. This graduate program focuses on research related to understanding the factors that support basic life activity processes and their mechanisms, including development, energy metabolism, adaptation and evolution, as well as research on dynamic and composite biological and ecological systems formed through the interaction of individuals, the environment, and biodiversity. Program graduates will move on to become researchers in biological fields, biotechnology experts knowledgeable in agriculture and food products, and specialists who can work towards the conservation of ecosystems. Life is constantly sustained by the many chemical reactions of biological molecules (enzyme reaction system). Technologies that utilize such systems are expected to play an important multifaceted role in the near future. This program is designed to educate future researchers, highly specialized experts, and Ph.D. candidates who, through their international perspective and specialized knowledge and skills related to research in biological functions and reaction mechanisms and the production and control of material by organisms, can flourish in and contribute to society. In this program, graduate students will gain specialized knowledge and learn technologies that will help them develop an understanding of life functions at the cellular, genetic, and molecular levels as well as master material production control skills. Through their independent research, graduate students will gain in-depth knowledge and develop advanced skills that will enable them to excel in professions that require highly specialized expertise, and ultimately contribute to the development of society as a whole. 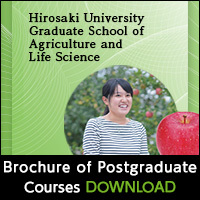 This program is designed to turn graduate students into skilled specialists who can conduct research on breeding technologies for new food plant varieties, soil and pest management in food plant production, and food product function and safety to ensure a sufficient, environment-friendly, and sustainable food supply. The program therefore requires that graduate students take courses that enable them to enhance their technical English and presentation skills and to master the research methods necessary to conduct research that results in publication. Relevant up-to-date knowledge will be conveyed in specialized courses. Research topics will be provided to graduate students, who will conduct research for two years in “Special Research I” and “Special Research II.” Through this research, students are expected to develop practical R&D and communication skills. The program focuses on research that contributes to the revitalization of agriculture, to advances in agricultural production techniques, and to improvements in the environment with the aim of establishing sustainable and multi-functional agriculture, food systems and human livelihoods. Graduate students will acquire specialist expertise and knowledge in agricultural production and agricultural management, economics and distribution, and will develop the ability to independently identify and solve problems in several areas of expertise. Ability to plan, implement, and assess the results of R&D in order to initiate policies that can help solve agricultural and horticultural problems through the practical and knowledge-based abilities outlined in the five points above. The program is designed to help graduate students become highly skilled experts with independent problem-solving skills and the highly specialized knowledge and skills necessary for the management of production infrastructure, the maintenance of a living environment for local residents, and development of planning methods, all with the aim of protecting and conserving the natural environment. All programs therefore require that students take courses on research methodology and presentation skills. Required courses also include research, hands-on exercises, and seminars customized for each academic discipline, as well as courses on water, soil, infrastructure, and the environment that are specifically designed for this Course.